A Medicine Basket is a container, woven of many strands, for Medicine. Recently, inspired by a dream a friend had, I made a mask I call "Medicine Basket - Gather and Offer". When I looked up "Medicine Basket" on the Web, I was somewhat disgusted to discover page after page of "Indian medicine baskets" but very little about people actually making them, or talking about what the significance of a "Medicine Basket" might be other than its fiscal or historical worth. So I returned to the contemporary work of Cherokee artist Shan Goshorn, as she is also a weaver of medicine baskets which she makes in traditional designs and techniques. They are woven from the words of broken contracts, and the names and photos of children taken from their families and forced to attend boarding schools. 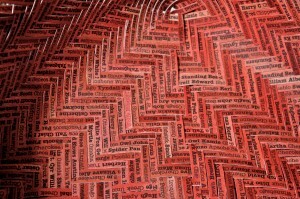 “Educational Genocide – The Legacy of the Carlisle Indian Boarding School” was created with a Cherokee-style double weave, and was made from splints of paper that had student’s names and historical documents and photographs. The artist weaves together the broken threads of the past to create healing baskets that re-member and re-join. My friend saw in her dream a woman wearing a mask that was a basket, the face emerging from the fibers of the basket. This image had meaning for me on many levels. A Medicine Basket is a container, woven of many strands, for Medicine. We can create Medicine baskets, sacred containers for the medicine that is needed at a given time, place, and for a particular person. We are also "baskets" ourselves, our intentions and histories woven into the container of life, day by day, strand by strand. 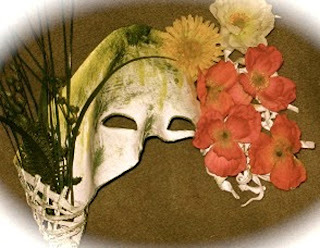 Since it's New Year, I wanted to think about this mask, and another mask came to mind, that of Ilana Stein, which she called "Gathering and Offering" from the poem she made for her mask. I've told this story before, but after making this mask I felt it was perfect as we stand here at the precipice of 2013.
your frustration and your greed. Offer to your neighbor and offer to the field. Offer all you’ve gathered, offer all your cares. the summer and the fall. And you’ve offered season’s greetings without going to the mall. A Hopeful Channelled Message......and one for me as well! Things are getting strange lately.................synchronicities abound, I even find myself having (oh oh) an occasional (mild) vision or two. To further facilitate this process, and get myself out of holiday blues, I went for a few days to the hot springs in Safford (very friendly place) where I sat in a pool where more ideas for "Numina" masks turned up. Later I was having some coffee in the common room with new friends I met there and we all paused as a middle aged native American woman, a very old woman in traditional dress, and a young girl walked in the door. I really did feel the energy change, become heightened in some way, and later the others commented that they felt the same. Delphina is a Navajo herbalist and medicine woman, who lives near Chinle, and so is her mother (her mother did not speak English, and Delphina translated for us). The first thing the elderly medicine woman said almost as soon as they walked in was that we should not go into the waters without first making an offering of corn meal (I can't remember what else), and asking for blessings from the spirits of the waters, and making prayers! And I thought, "Of course! Here I am indirectly asking for vision about a project that is about Spirit of Place (Numina) and I don't even know how to do what any traditional person does, which is exactly that. Ask permission, give thanks, make an offering to show appreciation, recognize that the waters are not just another inanimate "object", but a place where spirits reside. How could I forget?.....but it's so easy to forget, being from a world that no longer remembers these things. I reflect (in retrospect) how blessed I was to be "reminded" in such a way. Their entrance was so strange that, to be honest, I can't entirely remember all that was said, just a kind of intensity in the room. But I also note that the elderly woman (in translation from her daughter) said something about weaving looms, or weaving..........and here I am, having spent all these years writing about Spider Woman. And........here is another mask I just made the day before I left. Sometimes these amazing messages come to us......and we barely notice. Or we notice after they've happened. But I know it was a blessing, at least, a reminder..................to quote myself from a previous post: "The ineffable work with us in the arena of energy, in the field of dreams, synchronicity and soul language"
I invited Delphina to visit me in Tucson when she comes for the gem show, so perhaps I will have another chance to talk with a real Navajo medicine woman. That's a lot of money. Even the "additional" small change for Israel is a lot of money, when you consider what it could do at home and put to humanitarian uses. "Corporate CEOs, Wall Street executives and many politicians are working very hard to convince Americans that we are unreasonable and must continue to sacrifice – that cuts must come from Social Security, Medicare & Medicaid and other domestic programs. But they completely ignore, and refuse to address the biggest drag on our economy – unending war and outrageous, out-of-control Pentagon spending." My only source of security for old age is social security. In recent proposals, there is included a change in the cost of living adjustment (COLA) that will make cuts in Social Security benefits. It’s a real and harmful cut to the Social Security benefits we paid into. Social Security should not be part of any such deal anyway. By law, it can’t contribute to the budget deficit. I'm signing the petition http://www.jobs-not-wars.org/ and circulating it. We talk about a Shift: that is the essence of it. Back in July I wrote of having a "hot springs satori" while ernestly asking the universe, in a hot pool alone at midnight on the 4th of July in a little town called Safford, Arizona....what the Universe thought I should do next. I have just "retired", and feel sometimes like I'm being put out to pasture, and have a terror that my imminent fate is some kind of elderly senile purgatory with the golf cart crowd. Bearing these fatalistic thoughts in mind, I didn't really expect an answer from the Universe. But a few dips later - wham! - a very well organized academic paper of a project titled "Numinous" popped into my mind, in three distinct components, and nicely typed on a Word document! Not the romantic, visionary experience I used to have under similar circumstances. But there is was, an Answer. Which I wrote down, dripping, on some soggy paper. This kind of thing has happened to me before, although in a much more poetic manner. In fact, I believe that when we engage in true creativity, and when we enter the "realm of the Goddesses/Gods", we enter a seamless realm that is liminal, collective, and sacred. But this time I guess my guides have decided its time for me to become more organized. I realize now that "Numina" is similar to what I was proposing with Macha Nightmare for my Kickstarter project last year (unfortunately it failed). I thought that failure meant that was done and over, an idea whose time came, and then went.........but surprise! The masks I had made were in Marin with Macha, and another colleague, Ann, volunteered to pick them up, to be returned to me when I come to California for a conference in February. Somewhere along the way, Ann and Mana and Diane, all colleagues who have created rituals and performances with the previous "Masks of the Goddess" collection in the past, decided to create a Solstice event, and then something in March in Willits, California. So it wasn't over, and inspired, I've been making new masks. In fact, they keep arising in my mind, leering at me from the other side of Manifestation, saying "make me, make me!". I have to trust that there are Dancers, and Stories, also currently behind the Veil, for whom they wish to become manifest.............most recently I added "Dawn", "Drought", "The River Face", "Ocean", and "Tree" to the evolving collection. Now I'm working on one called "Gather and Offer", "Desolation", "Shadows of our Forgotten Ancestors", and "Rainbow Woman". And much magic and synchronicity has begun to occur, which tells me I'm somehow on the right track. I want to write about this in future posts, but for now take pleasure in sharing the little slide show about the evolving project above. Here's what I scratched on to a piece of damp paper.........and I reflect that it's also a variation on what I've always done since the day I first walked into a stone chamber with a ley crossing in Putney, Vermont, in the summer of 1982, thanks to master dowser Sig Lonegren. I felt vibrant energy there, I watched my divining rod "helicopter", and I've been asking myself ever since: "How do we speak to the Earth? How does the Earth speak to us?" So I make masks, because that's what my particular gift or "offering" is, with the hope that, finding them useful, we'll receive an answer. One last thought for myself, since it is the beginning of the 5th World, not to mention New Year 2013 - why do this at all? Because I believe there is so much wisdom we have lost, that needs to be re-invented for our time, among that "re-discovered, re-invented" lost wisdom, the use of sacred masks, and reverence for a "conversational world", for the many faces of Gaia. Whether that conversation occurs with a tree, or the great Goddess Pele, or the magic of a sudden butterfly, I do believe that once one has experienced it, one will never be the same. Component 2) Story. What might the spirit of a place, the "genius loci" say? How would "place" speak to participants? Perhaps, though visioning exercises, art process, meditation, creating handmade books, masks, or shrines that "engage, invoke and invite the numinous" to "speak"? Component 3) Vision. How might Numina, Spirit of Place or Elemental Powers, be "personified" or "voiced" in contemporary terms, even as they are now "dis-placed"? The Romans believed nature was inhabited by elemental forces they called Numina, and many Roman sites had little shrines dedicated to the "genius loci" of a particular place. Being in a reciprocal relationship with the Numina was important to the health, prosperity, and spiritual well-being of all who lived in any landscape. How can we regain this sense of “communion with place” - the healing springs, mysterious forests, or generous orchards - that are the true wellsprings of myth? Myth making has always been a way for human beings to become intimate with the world. In the past "Nature" was not just a "backdrop" or a "resource" – nature was a conversation. Our experience changes when environment becomes "you" instead of "it". Among the Hopi of Arizona honoring and being in balance with the Katchinas that preside over many aspects of their beloved land, and bringing them “to earth” with sacred masks and ceremonial dances, is believed to be essential to their survival. 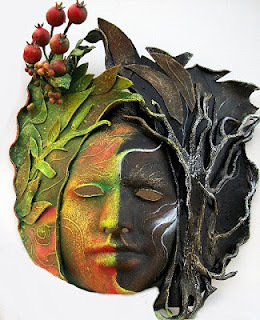 Masks thus to most indigenous peoples are a liminal, transformation tool, a means for different dimensions of being to interact, communicate, bless and inform. Most of us cannot live as early Romans, or indigenous people, but we can re-invent a “mythic dialogue” with the environment through storytelling, ritual, and with masks. 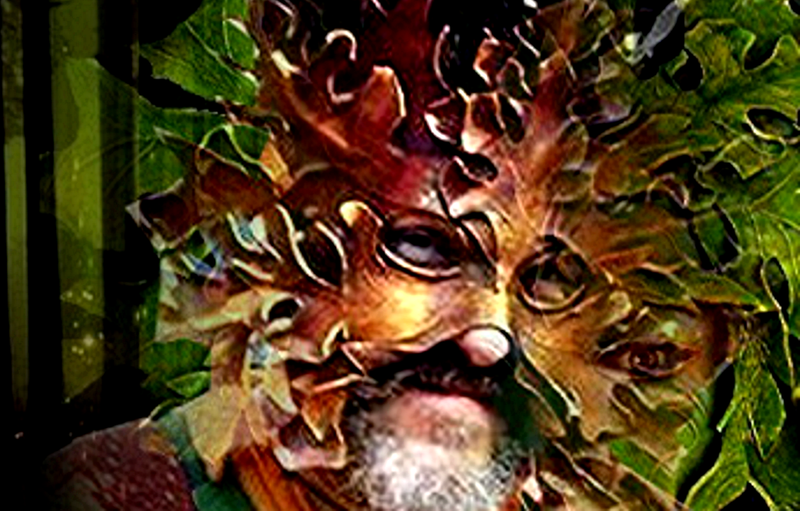 My evolving collection of "Numina Masks" invite others to “give voice” through prose, dance, and theatre to the numinous intelligence and unique qualities of where we live, to “put on” the elemental forces of nature as they are personified in myth, both ancient and new. Especially as we face climate change and environmental degredation: what might Pachamama, Earth Mother of South America, say? Or the “Spirit of the Redwoods”? Or the great volcano Kilahua? "A numen (plural: numina) is a sacred force, an impersonal but divine power. The gods have their numina as their divine power, but the gods themselves have been considered numina. The "divine presence" to which Plinius Caecilius refers is called a "numen." "In Roman literature we find that a numen is something 'of the Gods' dependent on the Gods, and not something that is either separate or prior to the Gods......The easiest way I have found to explain a numen is this. When you sit down in a chair and you feel the warmth of a person who has there before you, you sense his energy, his power, his presence having been there. In the same way, when a God or a Goddess have visited a place, Their presence radiates out into that grove, or that pool, energizing it such that it is more lush than the surrounding area, teeming with life, and filled with a certain presence that you can intuit and feel." "Working alongside and in harmony with a numen benefits a person by making his tasks easier and in accord with the Gods. Horace says that "By Jupiter's benign numina are the shrewd guided in his care and defended." And Servius warns that those who act contrary to the numen of a God act against the will of the Gods and can only expect failure.......Or as Livy put it, "You discover that all events turn out well when we follow the Gods in obedience, and ill when we spurn Them." "It is not a supernatural power in the sense of divine will overcoming the principles of the cosmos, but a power imbued in nature by the Gods to maintain the natural order of the cosmos. The providence of Ceres is to bear fruit (geres) from the earth and to create a regeneration of life (creare). It is through Her numina that She effects plants to germinate and grow. In a period of mourning for the loss of Her daughter Proserpina, Ceres may temporarily withhold Her numina and cause a barren winter to set in. But She cannot alter the natural order of the earth, nor of a seed to germinate, nor can She alter Her own numina into something different than what it is. She does not make the winter to come by exercising a numen of barrenness that is alien to Her own nature. In that same myth, none of the other Gods and Goddesses can bring about a return of spring. Their powers cannot effect that which the numina of Ceres alone may do. The numina of each God and Goddess are therefore a special power, unique to each of Them alone and not a general divine power that is diffused among the various deities. " "In practical terms, whenever one invokes the aid of a God or Goddess, what is asked is that the deity will project His or Her special numen so that whatever task is to be attempted shall succeed in accordance with the Gods. The two most basic prayers in the religio Romana are Do ut das, "I give so that You may give," and the formula: bonas preces precor, ut sis volens propitius, "I pray good prayers in order that You may willingly be propitious." 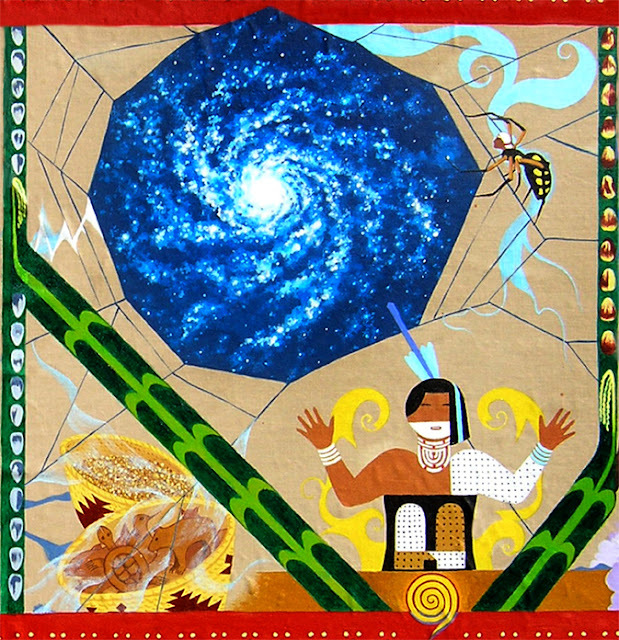 (Reciprocity)"
"Creation stories of Arizona and New Mexico praise Spider Woman. The Keres peoples call her Tse-itsi’nako, Thought Woman, who brought everything into being through the power of her mind. The Hopi remember her as Kokyangwuhti, who chanted the creation song over the Earth’s twin poles, setting in order stability and circulation. She created all living beings from earth and her own saliva, then spun shining webs of creative wisdom over them and inspirited them with her chant. In some traditions, old Spider Woman causes the Corn Mother -- or her daughters -- to emerge from the underworld, and they enliven all beings by singing over their images. Corn Mother emerges from the Sipapu, the opening of the womb of Mother Earth." Lydia Ruhle is an incredible artist (and scholar) whose Goddess Banners have travelled around the world (I first saw them at the Goddess Conference in Glastonbury). Here is her "Spider Woman" for the New Millenium. Visit her website for a wonderful tour into the ancient world: http://www.lydiaruyle.com/. Lydia also visited Gobekli Tepe (the name means "Navel" or "belly"), the oldest (12,000 bc) megalithic temple yet discovered, last summer - I'll write about some of what she discovered there, and the art she made, later. 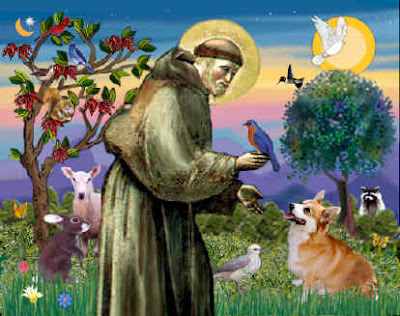 St. Francis lived his life with joy and appreciation for all things created. 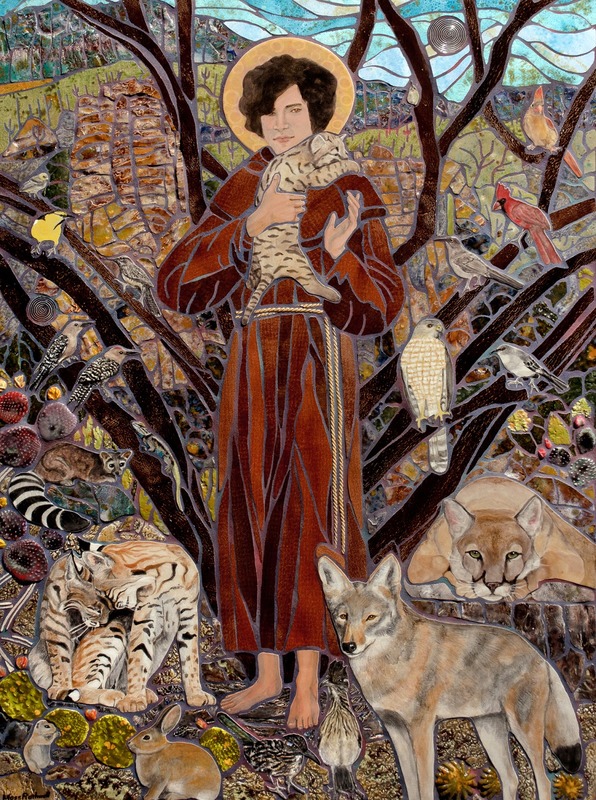 I had an artistic vision of St. Francis surrounded by the animals and birds of the desert Southwest. I wanted to show the calm and peace the animals might feel while in the presence of Francis. The beautiful Sabino Canyon and the blue Arizona sky are the background of my mosaic. The tiles have the texture of rock and vegetation. I painted the tiles of my birds and my lizard “Marco” using my photographs. They are frequent visitors to my garden. My inspiration for the Bobcats and the Coyote were from amazing wildlife photos by Sam Angevine, www.samangevine.com. He has allowed me to use his images for my models. The roadrunners in the foreground, “Bella” and “Edward”, are feathered friends of artist Geri Niedermiller, http://gekkosworkshop.5thelement.com . It's not even 6 months since the "Dark Knight" massacre in Colorado, or the massacre of 12 people at a Sikh Temple in Wisconsin, and now 28 people are dead in Connecticut, 20 of them children, at the hand of another young man with an assault rifle. And it's not quite 2 years since the shooting of much loved Congresswoman Gabrielle Giffords and the death of 6 people, when the President gave a beautiful speech right here in Tucson. But nothing has changed. This is also what the "return of the Goddess" is about. I felt like re-publishing Bill Moyers article from this summer, which he wrote after the deaths in Colorado. But I also was forwarded today an important letter by Henry Lowendorf of the Greater New Haven Peace Council. I feel like posting them both. There is no pain like the loss of a child. The tragedy that overtook Newtown yesterday suddenly dropped that pain on too many to count and left heartsickness in its wake. The children and the adults who tried to protect them have become waves of memories crashing inside of us. Our thoughts and prayers go to those so closely devastated with grief, a grief even shared around the world. As we, collectively, try to bear the unbearable, as we pick ourselves up to live on, to cope, and to look for means to prevent such future tragedies we must not be nearsighted in investigating the causes. This is not the first case of a mass killing in our schools. It is not the sole case of mass killing of children, for in nearby New Haven and Hartford that many children are shot and killed on the streets throughout every year. Because their lives are not taken in a short span of time, public attention is limited, directed elsewhere, and the shock and sorrow do not circle very far. Because they are mostly children of color, for many in the majority white population they are someone else’s children. Do we pause even for a moment when we read - do we even read? - stories of Afghan children, Iraqi children, Palestinian children, Congolese children, thousands of whose lives are brutally taken in lands battered by war? They are so far away. Why are these other children deserving less of our concern? Are they really unrelated to our current tragedy? What we witness at this moment are the effects of a brief war zone, one regrettably close to home. Let us remember a similarly painful tragedy in 2001 on September 11. Inexcusably, it did not lead to introspection about the cause and thoughtful efforts aimed at addressing and removing it. Rather what ensued was a violent reaction named “shock and awe” whose erroneous goals led to the deaths of tens of thousands of Afghans, hundreds of thousands of Iraqis, mostly noncombatants, little children whose lives were totally disconnected with 9/11 and thousands of our own precious children in avoidable wars. Those lucky enough to survive have been traumatized for life. It is not enough to question the availability of guns and gun ownership policies in the United States. For we live in an economy of violence that goes far beyond handguns. Our nation spends over a trillion dollars a year on building killing machines and actively using them, more than all other countries combined. Our nation maintains an arsenal of nuclear weapons that can instantaneously end the lives of all children and all civilization. Our nation recruits our youth, whom we parents have taught to cherish life, and teaches them to kill. Our nation buys billions of dollars of weaponry and sells millions worth of armaments at home and abroad, sales that fill the coffers of the manufacturers of killing machines, sales that bind us to the unnecessary, premature deaths of our global brothers and sisters. We must address the “shocking and bloody” tragedy in Newtown, and so many other tragedies like it, as the result of “spiritual death.” We must aim a keen eye to reach spiritual uplift. For only if we accept the responsibility to look beyond the heart of a grieving nation and seek out a fundamental flaw, only as we are willing to seek a higher truth and root out the culture of violence and an economy that feeds on it will we have reason to expect to see all of our children, here and there and there, live long and happy lives. As it should be. Only then. You might think Wayne LaPierre, Executive Vice President of and spokesman for the mighty American gun lobby, The National Rifle Association, has an almost cosmic sense of timing. In 2007, at the NRA’s annual convention in St. Louis, he warned the crowd that, "Today, there is not one firearm owner whose freedom is secure. 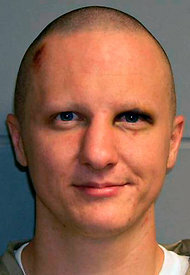 "Two days later, a young man opened fire on the campus of Virginia Tech, killing 32 students, staff and teachers. Just last week LaPierre showed up at the United Nations Conference on the Arms Trade Treaty here in New York and spoke out against what he called "Anti-freedom policies that disregard American citizens' right to self-defense." 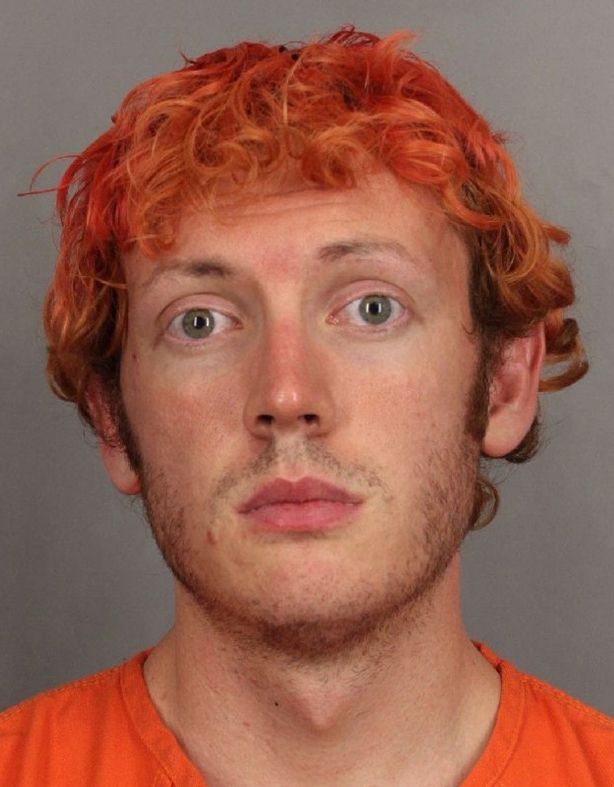 Now at least 12 are dead in Aurora, Colorado, gunned down by a mad man at a showing of the new Batman movie filled with make-believe violence. One of the guns the shooter used was an AK-47-type assault weapon that was banned in 1994. The National Rifle Association saw to it that the ban expired in 2004. The NRA is the best friend a killer's instinct ever had. Obviously, LaPierre's timing isn’t cosmic, just coincidental; as Shakespeare famously wrote, "The fault is not in our stars, but in ourselves." In other words, people. People with guns. There are an estimated 300 million guns in the United States, one in four adult Americans owns at least one and most of them are men. The British newspaper The Guardian, reminds us that over the last 30 years, "The number of states with a law that automatically approves licenses to carry concealed weapons provided an applicant clears a criminal background check has risen from eight to 38." Every year there are 30,000 gun deaths and 300,000 gun-related assaults in the U.S. Firearm violence may cost our country as much as $100 billion a year. Toys are regulated with greater care and safety concerns. So why do we always act so surprised? Violence is alter ego, wired into our Stone Age brains, so intrinsic its toxic eruptions no longer shock, except momentarily when we hear of a mass shooting like this latest in Colorado. But this, too, will pass and the nation of the short attention span quickly finds the next thing to divert us from the hard realities of America in 2012. We are after all a country which began with the forced subjugation into slavery of millions of Africans and the reliance on arms against Native Americans for its Westward expansion. In truth, more settlers traveling the Oregon Trail died from accidental, self-inflicted gunshots wounds than Indian attacks - we were not only bloodthirsty but also inept. Nonetheless, we have become so gun loving, so blasé about home-grown violence that in my lifetime alone, far more Americans have been casualties of domestic gunfire than have died in all our wars combined. In Arizona last year, just days after the Gabby Giffords shooting, sales of the weapon used in the slaughter - a 9 millimeter Glock semi-automatic pistol - doubled. We are fooling ourselves. That the law could allow even an inflamed lunatic to easily acquire murderous weapons and not expect murderous consequences. Fooling ourselves that the second amendment’s guarantee of a "well-regulated militia" be construed as a God-given right to purchase and own just about any weapon of destruction you like. That's a license for murder and mayhem and it's a great fraud that has entered our history. There's a video of which I'd like to remind you. You can see it on YouTube. In it, Adam Gadahn, an American born member of al Qaeda, the first U.S. citizen charged with treason since 1952, urges terrorists to carry out attacks on the United States. 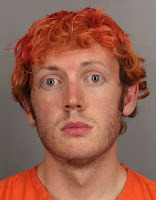 Right before your eyes he says: "America is absolutely awash with easily obtainable firearms. You can go down to a gun show at the local convention center and come away with a fully automatic assault rifle, without a background check, and most likely, without having to show an identification card. So what are you waiting for?" The killer in Colorado waited only for an opportunity, and there you have it - the arsenal of democracy transformed into the arsenal of death and the NRA - the NRA is the enabler of death - paranoid, delusional, and as venomous as a scorpion. With the weak-kneed acquiescence of our politicians, the National Rifle Association has turned the Second Amendment of the Constitution into a cruel hoax, a cruel and deadly hoax. "The Emergence to the future Fifth World has begun. It is being made by the humble people of little nations, tribes, and racial minorities. 'You can read this in the earth itself. Plant forms from previous worlds are beginning to spring up as seeds. This could start a new study of botany if people were wise enough to read them. 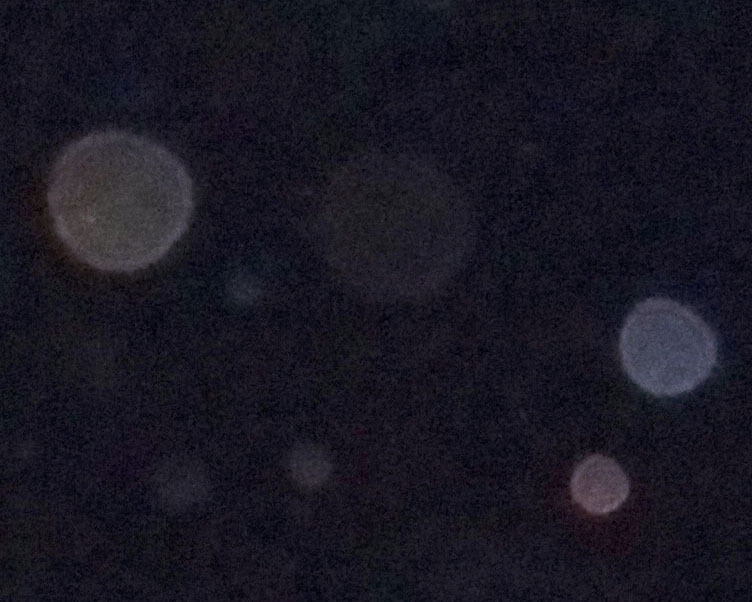 The same kinds of seeds are being planted in the sky as stars. The same kinds of seeds are being planted in our hearts. All these are the same, depending how you look at them." Since we approach the Solstice, I felt like writing about the Hopi prophecy, as they believe the "4th World" is ending, and the 5th World is to begin. In Hopi cosmology, there were three previous Worlds, all of which were destroyed as the New Age began. We are entering the Fifth Age. 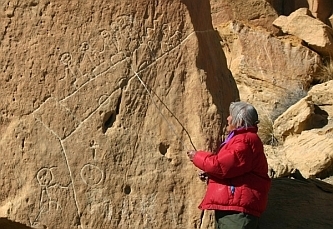 Grandmother Spider Woman is, in most of the stories, the one who leads the people into the next age, in most stories (although not all) through the Sipapu, the Kiva, which can be seen as a symbolic womb and birth canal. Hopi cosmology, as are all Pueblo culture cosmologies, is complex and has many variations. There is no doubt that there was trade and exchange between the Pueblo peoples and the Maya, and indeed Hopi language shares much with the Aztec language, so it is not surprising that the Hopi and Mayan calendars coincide in some ways, and also that mythological figures are shared in common. But I am far from an expert, and I can only speak of what I know in the most general sense. The Hopi have been an oral culture, which means that the prophecies, myths, and ceremonies have been passed on from generation to generation, changing and being influenced by external events. It's also important, in reading the many accounts of the Hopi prophecies on the Web, to realize that 1) the Hopi are traditionally very secretive about their sacred traditions and do not share them with outsiders; conversely, they may intentionally mislead informants, as a means of protecting their traditional wisdom from exploitation. Two, none of the Prophecies that have been circulating, including the well known work of Frank Waters who wrote "The Book of the Hopi" in the 1950's, as far as I can determine, were written by Hopi people. And 3), there is so much hype, co-option, disrespect, and fantasizing of the Hopi prophesies, and Native Americans in general, on the part of popular culture, that it's hard to wade through and find what the truth is. Having said all that, I'd like to share here a great article by Daniel Pinchbeck about the Hopi Apocalypse (see below after this post). The "Nine Signs" of the Hopi, written by Frank Waters in his book, is very famous and circulating widely. He lived on the reservation for three years and interviewed over 30 elders. Still, there is much that is questionable about his famous book. The "Nine Signs", he wrote, were given to a white minister, who happened to give a ride to a Hopi elder. The Minister conveniently died in the 70's, and the Elder, who told him his name was "White Feather of the Bear Clan", has never been traced. As many have pointed out, the Hopi usually have an Anglo first name, and then their last name is in their own native language. It may also be pointed out that everything in the "prophecies" could have been observed in the 50's, from the widespread terror of nuclear war to "the sea turning black and living things dying" (oil spills). The West has had, under Christianity, a very long fascination with the Apocalypse, and many groups for a thousand years have awaited the "Rapture", when Christ would return and the sinful world would be destroyed. While I believe the Hopi have prophecy (and great wisdom) I do not believe these "prophecies" supposedly given by a mysterious dying "White Feather" are authentic. "The end of all Hopi ceremonialism will come when the Blue Star Kachina removes his mask during a dance in the plaza before uninitiated children [ which has been interpreted to mean the naive or general public]. For a while there will be no more ceremonies, no more faith. Then Oraibi will be rejuvenated with its faith and ceremonies, marking the start of a new cycle of Hopi life."...... "You will hear of a dwelling-place in the heavens, above the earth, that shall fall with a great crash. It will appear as a blue star." This has been interpreted to mean the comet Hale Bopp, the destruction of the space station Challenger, even UFO's. I have to note that there were manned satellites in the late '50's that could have influenced this. However, the Blue Star Kachina removing his mask is very interesting, and I would like to learn more about that at a later time.......what the meaning of the masks are is complex. There is a later commentary (1998) about the Blue Star Kachina given by Robert Ghost Wolf (aka Robert Franzone, aka Robert Parry) that is very eloquent. The author claims to have received them from Hopi elders, yet it turns out that Ghost Wolf has been discredited by many sources as a fraud, and in researching him, it seems, indeed, very difficult to believe anything he may say. Perhaps the closest we can get to truth is reading Dan Evehema, a Hopi traditional leader (he died in 1999) , who was one of four Hopis (including Thomas Banyacya, David Monongye, and Dan Katchongva) who decided or were appointed to reveal Hopi traditional wisdom and teachings, including the Hopi prophecies for the future, to the general public in 1946, after the use of nuclear weapons against Japan. Evehema was co-author, with Thomas Mails, of "The Hopi Survival Kit". The "Hopi Survival Kit" includes a signed affidavit from Dan Evehema approving the book, and is the only written account of the complete Hopi prophecies. Evehema was a member of the Greasewood/Roadrunner Clan. Last summer, I visited the Hopi on their tribal lands in Arizona. The Hopi are thought to be the original inhabitants of the North American continent–this is what their own legends tell us, and archaeologists agree. My initial interest in the Hopi came from reading about their oral prophecies and their “Emergence Myth.” According to the Hopi, we are currently living in the Fourth World, on the verge of transitioning, or emerging, into the Fifth World. In each of the three previous worlds, humanity eventually went berserk, tearing apart the fabric of the world through destructive practices, wars, and ruinous technologies. As the end of one world approaches a small tunnel or inter-dimensional passage —the sipapu—appears, leading the Hopi and other decent people into the next phase, or incarnation, of the Earth. The 12,000 Hopi live in a dry and dramatic landscape strewn with enormous boulders, resembling the surface of an alien planet. Their towns are clustered on three mesas—high, flat cliffs overlooking vast swathes of desert. Traditionally, the Hopi are subsistence farmers; they work with ancient strains of corn and beans that are, almost miraculously, able to grow in that arid environment. For obvious reasons, water is sacred to their culture—many of their rituals are aimed at bringing rain. Each spring, each well, is precious to the Hopi. While I was visiting Hopiland I attended a rain dance in the town of Walpi, on First Mesa. Perhaps 50 men of the town—wearing masks and costumes and feathered headdresses —participated in the dance, which was held in the town’s center. The dancers are dressed as katsinas, the spiritual beings that are thought to control elemental forces. The ceremony is a form of possession trance—the goal is to summon the katsinas to temporarily inhabit the bodies of the dancers. The Hopi believe that their culture can only prosper if they maintain direct contact with the supernatural powers that manifest directly through the natural world. I can sympathize with Whiteley’s plight. Since I started exploring shamanism almost a decade ago, I have found myself living in two worlds simultaneously—the world of Western rationalist discourse with its empirical and materialist emphasis, and the shamanic realm of magical correspondences, supernatural forces, dream messages, and synchronicities. The shamanic realm is one in which human consciousness is not an epiphenomenon or dualistic byproduct of a purely physical evolution, but an inseparable aspect of the world, intertwined with reality at every level. It seems that quantum physics has attained a perspective that is similar to the shamanic view, acknowledging a direct relation between the observer and observed. I went to the Hopi as part of my research for the book I am writing on prophecies, studying the Mayan and Toltec obsession with the year 2012, the Apocalypse described in the Biblical Book of Revelation, the Hopi foretellings, and various modern Western philosophers and visionaries whose ideas offer a context or system for understanding these predictions. 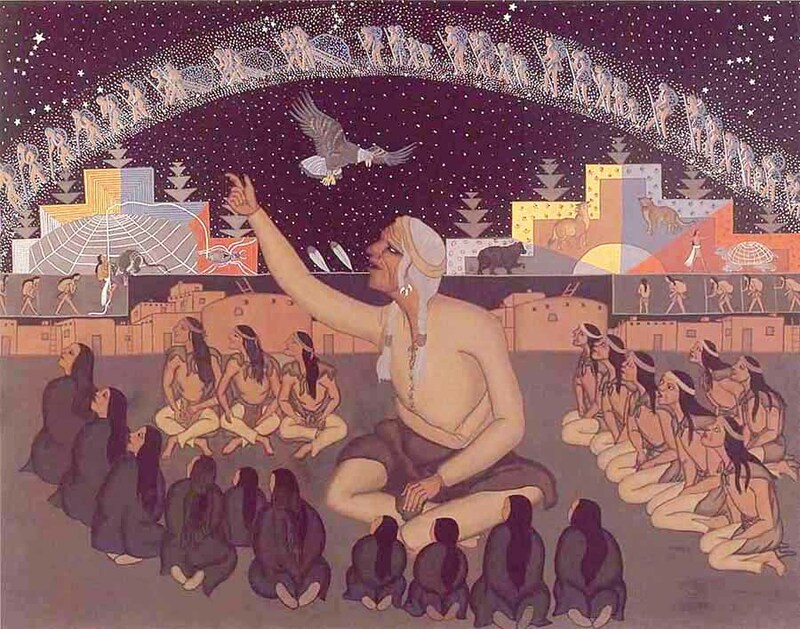 Before I visited the Hopi or even read much about them, I had a few powerful dream experiences that seemed to indicate, to me, the importance of my imminent encounter with this ancient tribe. After seeing the film Naqoyqatsi (“Life as War”)—the last in the trilogy of films beginning with Koyaanisqatsi (“Life out of Balance”), by Godfrey Reggio (appropriating Hopi concepts with no input from the tribe) — I had a dream of fiery demons at computer workstations, and awoke with the sense of a visceral supernatural presence flying through my house. The night before I left for the Southwest, I had an even more specific and frightening nightmare. In this dream, I was killed and dismembered by a disgusting-looking demon—who was simultaneously, in typical dream dislogic, the famous conceptual artist Bruce Naumann. In the dream, I returned to Naumann’s studio or the demon’s home and said, “Great—now that you have killed me, I control you.” I went to a bookcase and picked up a huge leather-bound volume titled “Grimoire” (a Medieval catalogue of imaginary beasts and supernatural creatures) and melted it down over a fire. As I did this, I heard incredibly loud Native American chanting and maniacal laughter. I awoke, once again, with the sense of a powerful presence, a kind of unhinged or wild diabolical force, looming overhead and then soaring away. While traveling to Hopiland I scanned several books of Hopi anthropology and folktales and found that the being who had haunted my dreams closely matched descriptions of Maasaw, the complex creator-deity of the Hopi. According to Hopi legend, when the Hopi first emerged from the Third World to the Fourth, they met Maasaw, who gave them the rules of conduct for life on this new land and introduced them to the rudiments of their agricultural system. Maasaw brought the sun into the Fourth World; but once he had accomplished this, he left the daylight world forever to haunt the realm of night and darkness. The name Maasaw literally means “corpse demon” or “death spirit” in the Hopi language, and he is considered to be the ruler of the land of the dead. Maasaw resembles the ambiguous deities found in Hinduism and Tibetan Tantra, who have wrathful and benevolent manifestations. Since his disappearance from the earth, Maasaw often appears to the Hopi in dreams as a terrifying presence, wearing a ghoulish mask. According to some accounts, Maasaw’s deviation began long ago in the Third World, where he became arrogant and defiant. His assignment to rule over the underworld was a kind of demotion. I wondered why—as seemed to be the case—this spirit had introduced himself to me, in my dreams, even before I arrived in Hopiland. I thought that I needed to learn more about the Hopi prophecies—and indeed, I did manage to visit an elder in that extraordinary desert landscape. Martin Gasheseoma took time off from working on his field of corn and beans, to tell me that the “purification,” as foretold, would soon come to pass, that there was no way to prevent it. “It goes like a movie now,” he said. However, even before I had found my way to this meeting, my perspective had shifted. I had realized that the essence of the prophecy—the solution to the riddle—was not in some transcendent or otherworldly event, but in the very immanent and real world around us. The Hopi way of life is threatened with imminent extinction. In the 1960s, the Peabody Coal Company was given a concession to mine coal on their land. They were also awarded the right to use water from the aquifer under Black Mesa to slurry the coal down a pipeline, built by the Enron Corporation. This operation wastes 1.3 billion gallons of pure drinking water annually. Of course, there are other ways to transport coal, but this is the cheapest for Peabody, and the company has continually fought against and effectively delayed all efforts to change their destructive practices. In the 1980s, it was discovered that the lawyer who negotiated the original deal for the Hopi was, at the same time, on the payroll of the Peabody Corporation—and the Hopi have received a tiny fraction of the revenue they deserve, while forfeiting control of their own destiny. According to US Government Geological Surveys, by the year 2011, the aquifer will be finished—already the Hopi are finding that the local springs on which they rely are drying up. In the middle-class New Age culture and “New Edge” festivals such as Burning Man, much lip service is paid to Native American traditions. Perhaps millions of white people hang dream catchers over their beds and put kachina dolls on their shelves. Despite this sentimental interest in indigenous culture and spirituality, precious little, or nothing, is done by us—those of us with the leisure for yoga and raw food and sweat lodges, who often sanctimoniously consider ourselves to be especially “conscious” or “spiritual” beings—to help the Native Americans on this continent. The indigenous people are resettled next to toxic waste dumps, abandoned to the least arable lands, ignored when the fish in their rivers are poisoned, when their resources are robbed from them. In every way, they continue to be treated with condescension and contempt. This is also what I intuited from Maasaw’s mocking laughter and deviant presence in my dreams: Some deep schism of the soul remains to be recognized; the wound can only be healed if we work to forge a real relationship with the indigenous world, to expiate our dominator culture’s guilt and denial through pragmatic action in this reality, as it is now. If this is the case, then the Hopi situation represents the perfect place to begin the reversal: They are probably the oldest and perhaps most well-known indigenous group in the US, zealously studied by ethnographers for over a century, while repeatedly and blatantly betrayed by the US government and private corporations. As climate change accelerates along with the global depletion of resources, we are being forced to recognize that our current system is unsustainable, even in the short term. The Hopi situation provides a microcosm of the global crisis—a cruelly ironic situation considering the essential meaning of their culture. As Whiteley notes, “The phrase ‘Hopi environmentalism’ is practically a redundancy. So much of Hopi culture and thought, both religious and secular, revolves around an attention to balance and harmony in the forces of nature that environmental ethics are in many ways critical to the very meaning of the word ‘Hopi.’” Visiting the Hopi, it occurred to me that indigenous prophecy, in itself, arises out of a deep level of attunement to the natural world, rather than anything “spiritual” or immaterial. According to Vernon Masayesva, of the Black Mesa Trust (www.blackmesatrust.org): “It is our water ethic that has allowed us to survive and thrive in one of the most arid areas on planet Earth. It is the knowledge and teachings of our elders that have sustained us. This water ethic that has been handed down to us by our ancestors we are eager to share with everyone who will be facing water shortages—and according to some studies, water wars—in the next few decades. When the water is gone from Black Mesa, so will be the traditional cultures that could have taught the world so much about living successfully with less.” The Hopi prophecies also tell of the return of Pahana, the elder white brother, in a real exchange of knowledge and a true communion, as the Fourth World comes to an end. Like so many manifestations of our neurotic and alienated culture, the Koyaanasqatsi films create a mood of inescapable doom and approaching cataclysm. Personally, I reject this attitude. We still have time to save the Hopi and other indigenous groups — perhaps, by extension, ourselves—if we are willing to learn from them and fight for them, rather then appropriating their spirituality while ignoring the destruction we keep inflicting upon their world. 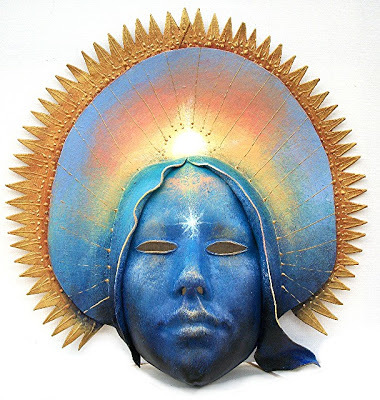 *** This is of great interest to me, as a person who has attempted, with the communities I've worked with, to study about, and create, a Sacred Mask collection (The Masks of the Goddess, 1998-2008). The intention of the performers was to invoke, and bring the energies, of the Goddesses to the performers and the participants/audience. And so it often was. I also think, when I read this, about the work that has been done at Findhorn, Perelandra, and the Sirius Community with the Devas, the elemental beings that help the plant world to manifest. Katchinas. Numina. How sad to think that we have mostly lost this understanding. My Books are E-Books too!